The Merri Creek flows about 60 km from the Great Dividing Range through Melbourne’s northern suburbs to the Yarra River. 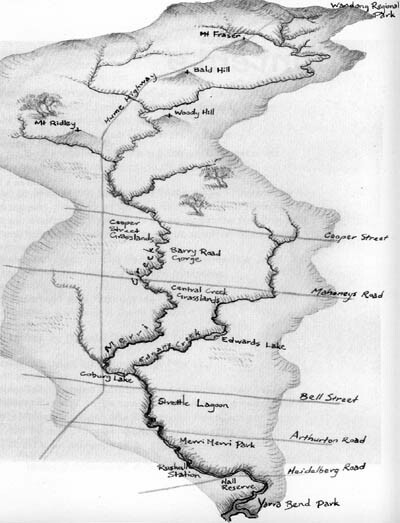 Tributaries of the Merri Creek include: Edgars, Merlynston, Central, Curly Sedge, Aitken and Malcolm Creeks. The Merri Creek is an environmental, heritage and recreation corridor that draws its significance from its role as a continuous corridor as it does from the qualities of individual reaches. All areas of the Creek are important because they contribute to the linking of areas of environmental, heritage and recreational value along the Creek. The Merri Creek and its immediate surrounds are host to some of the most threatened ecosystems in Australia. The Creek has a unique role to play in the preservation of threatened flora and fauna and the maintenance of vegetation communities that in other places have almost been totally destroyed. The Creek is the focus of a large number of pre and post-contact archaeological sites which as a group are highly significant. Many unknown sites are likely to exist and the areas likely to have the greatest density of these are sensitive to development. Revegetation works and parkland development including path construction have created a linear park of outstanding quality and landscape character – one which plays an important role in the park system of the metropolitan region. While walking or cycling along Merri Creek you may be aware of the indigenous plantings, constructed wetlands and the animal life of the creek corridor. But there is an underlying element to this - the Merri valley contains many millions of years of history and secrets. Over 400 million years ago the sea covering this area receded. It left behind a layer of yellowish marine siltstone and sandstone rocks. Around 65 million years ago non-marine sediments left a sandy layer behind. Over time the ancestral valley of the Merri Creek developed, eroding through these sediments. Then, from 0.8 to 4.6 to million years ago volcanoes such as Hayes Hill (about 5km east of Donnybrook) and Mt Fraser (near Beveridge) erupted, sending lava on an epic journey along the ancestral valleys of the Merri and Darebin Creeks and into the valley of the Yarra River as far as the CBD. Our modern day Merri Creek was formed over many years, by incising through the lava surface. Please call 9380 8199 to request free copies of these leaflets printed on recycled paper.